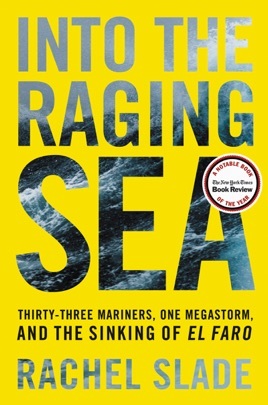 This well-crafted and gripping account lays out the circumstances which led to the deaths of 33 crew members of the container ship El Faro when it sank east of the Bahamas in 2015 during a hurricane. Journalist Slade frames the tragedy with a meticulous review of all the ways in which it could have been avoided. Deregulation was a major factor, she concludes; El Faro was allowed to embark from Jacksonville, Fla., to Puerto Rico, despite numerous vulnerabilities, including outdated lifeboats and design flaws that left it prone to being flooded in bad weather. The push to minimize oversight was driven by shipping companies such as El Faro's owner, Tote, whose profits depended on making speedy delivery of goods. Capt. Michael Davidson, meanwhile, repeatedly ignored advice from his crew to take a route that would keep the vessel further away from the powerful storm, perhaps out of fear that his professional future hinged on an on-time delivery. Slade had access to 26 hours of audio on the ship's voyage data recorder, and she presents the actual conversations crew members had before the end, highlighting their stoicism. This is a painful and poignant narrative. An excellent work of research, journalism and clear writing style. Explanations of hurricane formation and behavior, ship construction and performance and the human element in sailing were very informative. One suggestion: a map of the ship’s route keyed to critical times and the location of the storm and its eye would have most welcome. Ms Slade and her publisher knew the first titilating book to the trough about this tragedy would sell big. A very engrossing read. Didn’t know anything about this actual event, so reading about it and learning about the maritime industry (what an absolutely criminal mess) made me furious and sad. As long as rich ship owners exist, we will continue to see these preventable tragedies happen. I just hope authors like this one continue to tell the world about them.